Grace your garden with exquisite design and motion using our new top-selling Large Pinwheel Spinner! This majestic Kinetic Wind Art Garden Spinner stake stands nearly 6 feet tall and embraces the wind with hypnotic elegance, spinning in multiple directions and speeds. 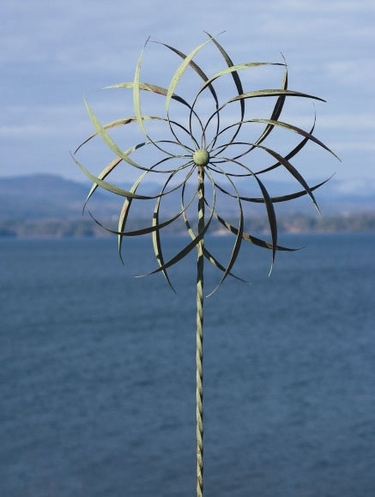 If you enjoy unique garden wind art, this high-end garden stake is certain to become your favorite wind toy. One thing that we really love about this metal spinner, is that the allure of this spectacular design is displayed in complete stillness and in motion! Many spinners only look good when they are in perfect standstill, and in a particular position, or only fun when they are spinning fast like crazy. Not only does this Large Pinwheel Spinner look like art at standstill, but the variable direction and speeds of the individual tines creates an ever changing design of geometrical motion. The Large Pinwheel Spinner by Ancient Graffiti comes in an antique copper verdigris finish, and stand firmly in the ground with a triple-pronged 15" wide ground stake. The bottom stakes are over 7" deep - this unit is not going turn or blow over! This artfully hand-crafted metal spinner has been designed with elegance and durability in mind, so that it truly showcases as garden art when still, and provides a visually stimulating effect when spinning in the breeze or high winds. Spinner Size: 22" Diameter, 8" Depth. Overall Size: 68"H above ground (75"H overall). Heavy Duty 7" Triple Pitched Stake for added stability. Elegant Design when still, hypnotic when spinning.